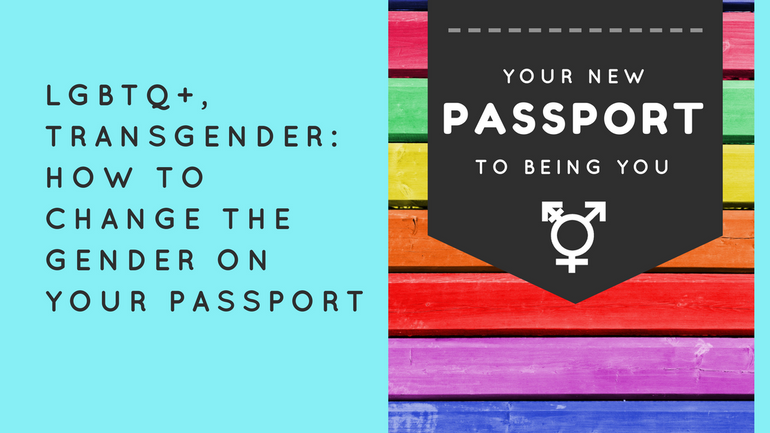 To celebrate International Transgender Day of Visibility, we’ve put together a step by step guide to help you change the gender marked on your British passport. We began our journey by sending out a survey to LGBTQ+, transgender and transsexual groups to see what hurdles they came up against and what advice they have. 88% of those surveyed said it was definitely worth changing your passport and would recommend it to someone else. First, let’s answer some questions about changing your passport in the UK. Can you apply for your trans passport online? You can find and download your application forms online from HM Passport Office. Applying for your passport online is actually cheaper than going into your local Post Office. Most of the evidence or proof will have to be sent in the post as hard copies are required as part of your application. How long does it take to change gender and the name on your passport in the UK? HM Passport Office states that passport changes and renewals take around 3 weeks. Based on responses from our survey, most applications take between 2 weeks and 6 months* to complete. There is no finite trick to speeding up this process. However, if you use the Post Office’s Check and Send Service, you can reduce your chances of being rejected since they check your evidence on the day. You can also pay to fast track your application for an emergency passport; it costs between £177 and £187 (cost of your passport is included) but there’s no guarantee it will get to you any faster. Generally, the Government advice is to not book a trip abroad until you have your new passport in your hands. *Why can it take up to 6 months? We found that some of our survey responses included the time they spent gathering evidence needed for the change of their passport, so it’s worth thinking about the bigger picture when it comes to an overall timescale and how long it’ll take to get your new passport. How do you change gender on your British passport? Jump straight to our step-by-step. If you have any burning questions, feel free to ask them in the comments below but please understand that we cannot advise on any legal or medical matters. This is a guide to transgender passports, not an official document on UK legislation or medical organisation. Now, let’s sort through some rumours. What are the transgender passport requirements and what kind of proof or evidence should you submit to the UK Passport Office to show that you are trans and want to change your gender and name? It’s not essential to have a GRC (Gender Recognition Certificate) or have had gender reassignment surgery to change your passport (this is thanks to a legislation change in UK Law in 2016). However, you do need a GRC if you want to change your birth certificate. As outlined by one of our survey participants, “a diagnosis of gender dysphoria is not needed to change your name and/or gender on your passport – your GP can write this letter for you if they feel comfortable doing so”. What will your gender options be? Gender ‘x’ is not an option on British Passports so if you’re changing the gender on your passport, it has to be binary. Therefore, your choices in the UK are male or female. Homemade deed polls are absolutely accepted in your application. You do not need to pay for a solicitor stamp, statutory declaration or governmental deed poll to change your passport. Don’t just take it from us. 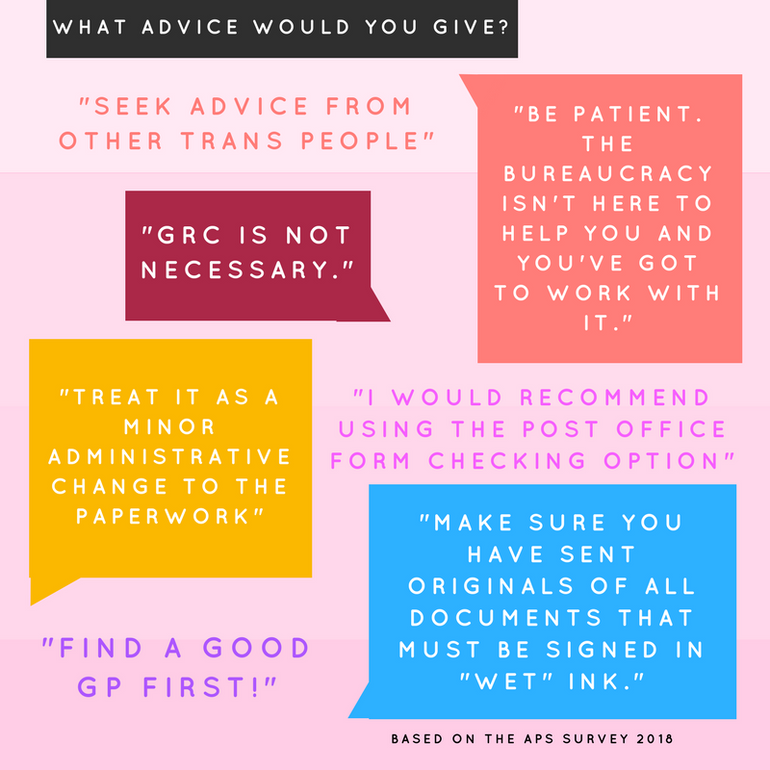 Here’s some advice from transgender, transsexual, councillors and family members who going through the same passport application. If you’re wondering whether travelling abroad is a good option for you, check out the LGBTQ+ Travel Tips guide. We look at best and worst destinations as well as protocol for getting through airports and what to look out for. 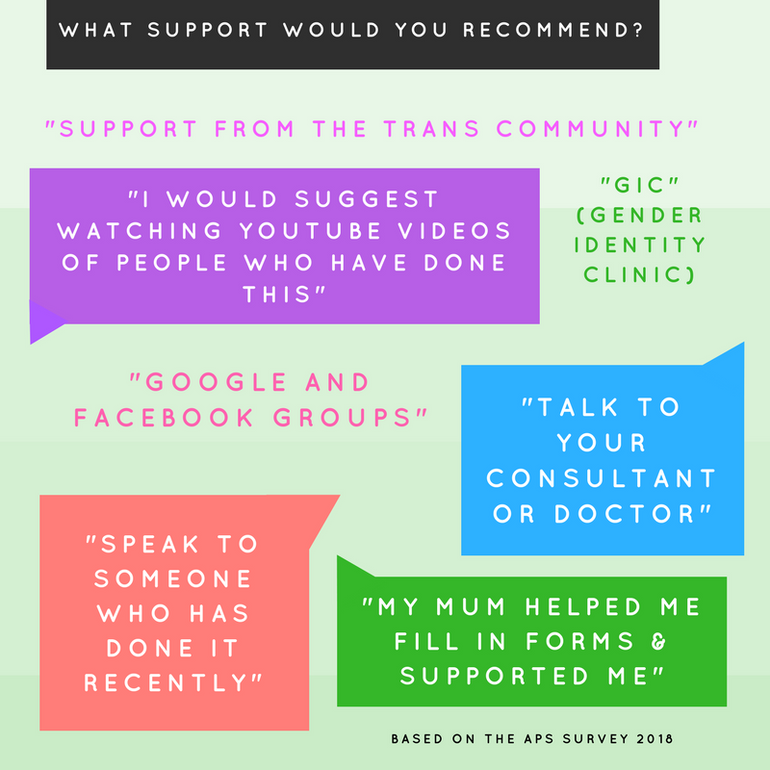 We also asked our survey participants what support they would recommend before starting the process. The response to our question was varied. Some participants said they were supported by friends and family, others read online forums and some said they didn’t need any support: “none… it’s easy!”. The amount of support you need or want, depends on you as an individual. Here are some initial ideas from our survey participants. A letter from your doctor, GP or consultant. This is the most common piece of evidence to submit as part of your transition. It’s the one which says you legally want to change gender and intend it to be permanent. You can get these from one of three places: your GP, a gender clinic or a therapist. Unfortunately, most places will charge you for the letter. NHS surgeries usually offer one for £25, but most therapists and gender clinics can write them for free. What to watch out for: They need to sign a letter which specifically says that you “intend the change to be permanent”. Make sure the wording is accurate or your application might not go through. If you choose to submit one of these letters, you also need to send evidence that you’re using a different name to the one you were born with. We recommend sending a deed poll or letter from your local council or pay slip with your new name here. A deed poll is the piece of paper that proves you’re using a different name to the one you were born with. If you submit this one, you must also choose another item to show your gender has also changed. A GRC or doctor’s letter make a great partner to this document. One, print out your own deed poll at home for free (here’s a free online deed poll generator used in other transitions, freedeedpoll.org ). To qualify your deed poll, all you need is a witness when you sign it. They cannot be a blood relative and have to be older than 16. If you want a solicitor’s approval, these are called Statutory Declarations or Statutory Documents. Firms usually charge for these and they have no more authority with the Passport Office than a homemade deed poll. Watch out for your countersignatures. Your deed poll is still legal if you make it at home, but any irregularities with countersignatures may raise questions from the Passport Office or at the Post Office Check and Send Service. You don’t need to pay for an official one from government as proof here if you don’t want to. So long as your name(s) are clear and your countersignatures are in order, it is all perfectly legal. If you want proof of your name via an official deed poll from government, it’ll set you back £36. On the flip side, all the hard work is done for you and you just need to fill in this form: HMCTS: Court Form 2722 . You can enrol for this once you’re 18 (you’ll need a parent or guardian’s help if you’re younger). Basically, it’s the step up from a GP’s letter. A GRC may be something to consider if you ever want proof of your gender. This includes changing your birth certificate or addressing the change with your employer. You don’t necessarily need this paperwork for your passport since you have others to choose from but it’s useful evidence to change other documents like your drivers licence and can affect your prison, pension and posthumous arrangements. As your most expensive option, it comes with a £140 admin fee but there are bursaries and reductions available to help. Updated birth or adoption certificate with your correct gender on it. Here’s how to update your birth certificate , it currently costs £9.25. Regardless of where you live, you need an approved GRC to complete the Birth Certificate application (GRCs costs £140). If you live in the Republic of Ireland or Scotland, the rules are slightly different. It costs £50 in ROI to change your name and £54 in Scotland plus the reissue fee. So watch out for hidden costs! What’s the cheapest way of providing evidence to change my passport? It may look expensive, but don’t panic! See our pricing table which lays out all the costs of changing your passport and should help you find the cheapest option for you. What’s the most common pieces of evidence submitted as part of your transgender passport application? Based on the Airport Parking Shop’s Spring 2018 survey, we found that 43% of people submitted a letter from their GP, doctor or therapist, while only 3% of responses said that they submitted a Gender Recognition Certificate. The most common combination sent to the HM Passport Office was a GP letter, deed poll and payslip. 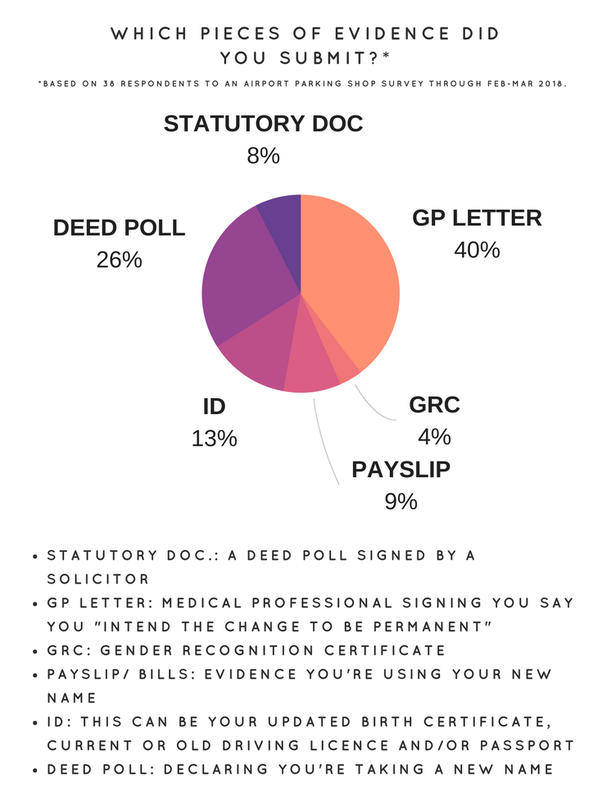 The GP letter is the part which highlights your trans gender change, the deed poll shows your new name and payslip demonstrates that you’re using your new name and pronouns. When your paper proof and confirmation letters come back through the post or if you’ve got your GP letter in your hands, you’re all set! You can now apply for your new trans British passport. Visit the government’s online passport service or go to a local post office and fill out forms with them. The Post Office offers a Check and Send Service to double check your application will go through. Since it’s not a simple passport reissue, it might be worth going into a branch. Getting a new passport will cost you £75.50 for a standard 32-page, or £85.50 for a jumbo 48-page book online (Post Office prices are between £85-95). You can always leave it until your current passport goes out of date and needs renewing, if you’re comfortable travelling as the ‘old you’, that way you get the most use out of all of your passports. It is pricey but don’t let it stand in your way. What if you need your new passport as an emergency? You can pay extra for an emergency passport, but the general rule is don’t book a trip unless you have your new passport with you already. If you need it fast, the speed service costs £100 and comes with no guarantees. Step 3 – Phone a friend and get your countersignatures. UK legislation states that you’ll need some independent people to sign to say that you are who you say you are. They cannot be related to you, this means it can’t be your mum, your aunt or second cousin. They need to fall into an “approved professional” category. For a full list of approved professions, see the government website. To give you an idea of “suitable professions”, they can be an optician, teacher, accountant or similar, the list goes on. Here’s all the approved professions, i.e. the people you can ask to be your countersignatures. Alternatively they can be a ‘person of good standing in their community’, so a local volunteer such as a registered GirlGuide, Scout Leader or Church Warden. They cannot live with you, even in a lodger or spare room arrangement. What are they actually signing for? Countersignatures are to confirm that all the information you’ve provided is true, as far as they know, which includes your transgender passport photo, name, gender, etc. Everyone registering for a new passport needs to go through this, so don’t worry, you’re not alone. Your friend’s mum who is an optician and has known you for 2 years or longer. They have a Irish passport and live in the UK. Your old boss who owns a pub (under a licensee of a public house), who you worked for over 2 years and get on with. He’s got a British passport and lives in the UK. Your secondary school teacher who has known you since you were 11 (you’re now 18 or older). They have a British Passport and live in the UK. Once you’ve filled out the above forms or collected your own, make sure to send them to the right places. For the most part, this is will be to the HM Passport Office. We recommend opting for the Check and Send Service from the Post Office which costs £9.75. It means your passport photo and evidence can be double checked by Post Office staff to reduce your chances of being rejected and gets you next day postage. You can ask for a refund on your Check and Send Service in the unlikely event that your passport is rejected. Since they’re important documents, it might be worth sending them by secure delivery. This can cost around £3 at your local post office. What might happen: it’s very rare, but you might be invited to an interview with a Passport Customer Service Centre near you. There are 7 nationwide in big cities: Belfast, Durham, Glasgow, Liverpool, London, Newport and Peterborough. This is just to provide more evidence and check that you are who you say you are. Here’s some advice from one of our survey respondents on their experience sending valuable documents in the post. Step 5 – You’re good to go! Your confirmation letter and passport should come through the post within the next few weeks. Congratulations! You’re ready to start a new chapter, and with your new passport. The only limit is your imagination – so get on a plane and show ‘em who’s boss! How much does it cost to change gender on your passport? £85/ £95 Post Office application for your new passport (standard 34-page or jumbo 50-page, £58.50 if you’re under 16). This is via an in person paper application. £142/152 For 1 week express delivery on your passport (standard 34-page or jumbo 50-page). The fast track option comes with no guarantees, no refunds and has to be done by appointment at a Passport Customer Service Centre. This price includes the passport itself. £177/187 For 1 day express delivery on your passport (standard 34-page or jumbo 50-page). This is currently an online trial service so there are limited appointments available and no refunds. This price includes the passport itself. £10+ New Passport photo (from any high street store or photo ID booth) such as Boots, Jessops, Timpson or independant stores. Don’t be worried by the table above, we don’t all need to spend £443.40 fixing our passports. Avoid spending money on GRCs, Birth Certificates or official deed polls by writing your own deed poll at home for free. We may recommend the £9.75 Check and Send Service, but it’s not a requirement. The cheapest passport you can get is £75.50. It’s the standard 34-page book through an online application, without fast track service or secure delivery options. Take a look at the Government breakdown of passport prices. We would like to thank everyone who responded to our survey and hope we can help readers change their passport and enjoy travelling the world. This information was correct as of January 2018 and is provided as a helpful guide not as legal advice. 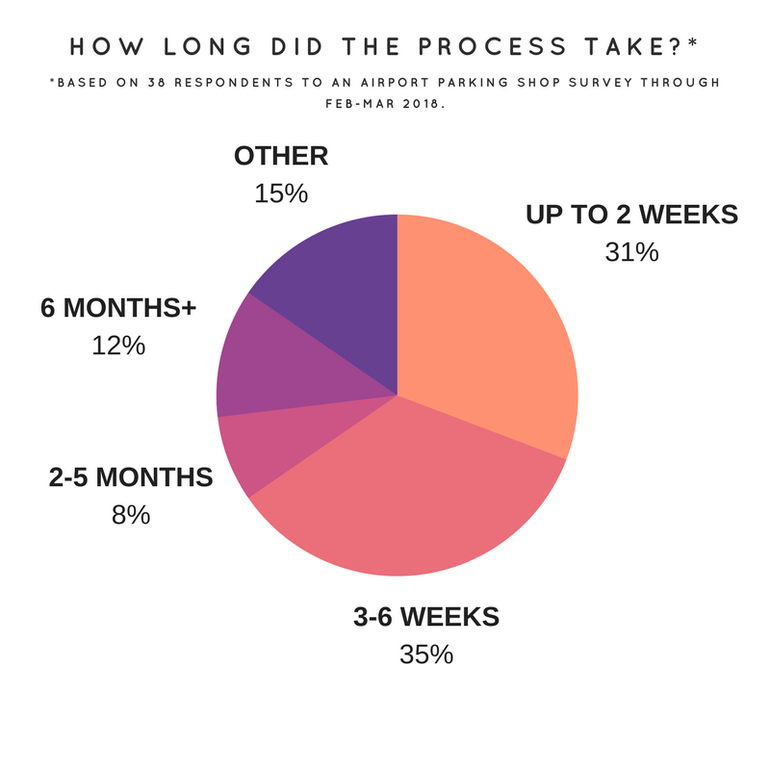 All numerical data and quotes came from an Airport Parking Shop survey between February-March 2018. Our participants were anonymous transitioning individuals or people helping someone else to change their passport. Please see the government site for more information and official UK legislation and guidance on changing your passport. We have a PDF version of this guide available for community groups to print out in order to help explain the process to parents, guardians, transitioning people and support workers. If you would like the printable PDF version of this guide, please contact support@airport-parking-shop.co.uk and we’ll be happy to assist you. My life is filled with good food, music and four legged friends. When I'm not walking the dog or being creative, I'm getting ready for my next adventure around the world. I love writing travel guides, blogs and quizzes. Hi Rachel, glad you liked our blog. We really appreciate the support from Merton LGBTQ. This is good, but has the old passport prices on it – prices went up last week! Thanks for the tip, Lee! I have updated the table so you should find the prices are correct now. Incredibly helpful article, thank you so much. One thing it didn’t cover was whether a trans person needs a counter signature on their new photo IF they can still be clearly recognised from their old/current passport photo? I currently don’t have access to someone suitable that could sign my photo. However, I’m still a pre T trans guy and in my old photo I have short hair, “pass” well, and look very similar to my current photo, which is distinctly male. (Thank you eye brow gel for the faint moustache, lol). I checked the official gov passport website and I seem to be ok. But as I am changing my name, gender and passport photo, I would like to be sure. Could you give your opinion on this please? Thanks for getting in touch. According to the UK Gov site, you need a countersignature “if your appearance has changed AND you can’t be recognised from your existing passport”. If I were you, I’d try and find a countersignature anyway – you’d be surprised how many people around you can probably sign for you. This is purely because the appearance of your new passport photo is completely subjective and if it gets rejected, you’ll have to re-apply which can be expensive. In essence, you should be fine – but I can’t guarantee your new photo will be approved without a countersignature. Thanks for getting in touch, Charlie. You do not need a GRC to change gender on your passport in the UK as you can see in the article above; you can apply without one, no problem. A deed poll and GP letter will provide enough evidence for you to apply for your new passport. – if you’re submitting a deed poll, you also need to provide evidence that you are using your new name (this can be something like a pay slip or electricity bill). – Some GPs can be reluctant to write a letter and will charge (see our pricing table for the latest costs). I recommend talking to your gender therapist if you have one – they’re more likely to write you a letter and they can do it for free. – All you need to remember is that on the letter, your health professional will need to include that you “intend the change to be permanent”. The fact that you’re going away for 3 months shouldn’t affect your passport rights, but make sure you can sort it out in advance in case you need your new passport for any visa applications. Hope that helps! Hi, this is really useful. However, i am looking in to having reassignment surgery abroad and i wondered how i would go about travelling back on my original passport, or if i need to obtain a new one to return to the UK. Thanks for your comment and good luck with your upcoming surgery! So long as you look recognisable enough to your original passport photo when you travel back to the UK, you will not need to get a new passport. If you’re going away for facial cosmetic surgery or if you’re going away for months on hormone treatment and you think it’ll change your facial appearance – then I recommend contacting HM Passport Office and letting them know in advance. So long as security can recognise you, your passport is in date and your information is correct (DOB, Place of Birth, Passport Number etc. ), you’ll be fine. As a heads up – some of our survey respondents told that travelling with a passport saying their old gender worried them but usually reported that it went smoothly. It’s something to bear in mind if you’re anxious about travelling but passing through security should be nothing to worry about and it completely legal. Remember, when you want to update/renew your passport, you can follow our steps above and change your gender and name on your passport at anytime. Thanks for your question. We have contacted our friends at Free2B Alliance to obtain some more information on this for you and we will get back to you asap! If you’re based in London Natalie, Free2B Alliance run a parent group which aims to offer information, advice and guidance to support parents of trans children. Further to this, they will also be launching a new youth club for 9-13 years old in March!! I do hope this information is helpful; let us know how you get on. Hi Helen, thanks for getting in touch. Firstly let’s look at the countersignatories you’ll need. UK Government states that signatures can come from anyone holding a UK passport. If your daughter’s teachers in Singapore hold a UK passport and have known her for 2 or more years; then they can absolutely sign the declaration. If not, you may need to ask around to find someone to sign for you – your next door neighbour or family friend who has a UK Passport. Unfortunately your family in the UK cannot sign this since relatives are not accepted as countersignatories (see Step 3). Second, what evidence do you need if you’re under 18? You can apply for a government deed poll for under 18s here. You can use this as evidence when sorting your daughter’s new passport. As guardians, you and her father will both need to sign to say she has your support in this change as part of the application. If she has a saturday job pay-slip, GP letter or another form of ID, you should also be able to supply these as part your application. Hope that’s helpful. Best of luck with her CAS trip in June! So if I only have deed poll I can’t change my gender on my passport to female? We live in Australia but have British passports ,my childs passort is up for renewal, they are 15 ,what age do they have to be to change gender on their passport? I’m a transgender woman from almost 2 years. I changed my name with deed pool, I work from one year under my new name, I have my bank accounts under my new name, I have payslips and I have letters from my GP in Spain and my psiholog from Spain where says i have gender dysorfia. I can get translate those letters or I can get my GP to give me a new one. So, if I have a deed pool, GP letter can I do my passport? I need to mention that i lost my ID a few months ago and my birth certificate. I have only a copy of my old ID with my old name. From almost 2 years I live full time as Ella Kiss , in UK I’m legally changed with : deed pool, gp, bank accounts, job under my new name. Being a Romanian citizen living as a transgender woman from almost 1 year and a half, with my new name changed,I will be able to apply for a trans British passport. I’m living as 1year and a half as transgender woman but I’m in London from 2014. Please let me know if I’m allowed to apply, because I need to do it this month, and if i can do it i dont need to go in my country where i can face obstacles. All of the documents you need to apply for your new passport are listed above under the section “Let’s take a look at how to change your passport”; and it states “The most common combination sent to the HM Passport Office was a GP letter, deed poll and payslip” so as you have these three, I’d suggest using them all to apply. Be aware however that there are currently higher volumes of passport renewals at the moment in the run up to Brexit, so your application process may take longer than normal.